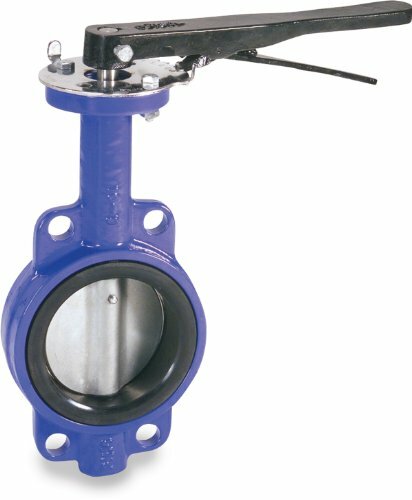 This Smith-Cooper International 160 series wafer style butterfly valve is made of iron for compressive strength and resistance to wear. It has a lever handle, Buna-N seat, a nickel plated ductile iron disc, and flanged connections on both ends. This wafer-style valve fits between two pipe flanges and is designed to retain a seal against two-way pressure to prevent backflow in single-direction systems. The disc is made of nickel plated ductile iron for compressive strength, corrosion resistance, and more flexibility and elasticity than cast iron. Buna-N seats are high tensile strength and resistant to oil, fuel, and other chemicals. The lever handle rotates the disc in the valve seat to fully open, regulate, or stop flow through the valve. This valve has a maximum pressure of 200 pounds per square inch (psi), and an upper temperature range of 150 degrees Fahrenheit. Flanged connections surround the valve body on both sides for bolting to pipes and for easier installation and maintenance than welded connections. Maximum pressure of 200 pounds per square inch (psi); Upper temperature range of 150 degrees Fahrenheit.